Doctors have a way to protect pets from diseases: it’s called vaccination. Here’s why our clinics recommend them. Vaccine history starts with an epidemic of smallpox, which killed millions of people. In 1796, a physician named Edward Jenner noticed that the milk maids, who were routinely exposed to cowpox, did not get sick with smallpox. He wondered whether their exposure to cowpox protected them … and the idea of vaccination was born. A vaccine exposes the immune system to inactive or incomplete disease-causing agents to train the immune system to quickly and effectively respond when exposed to the real thing. 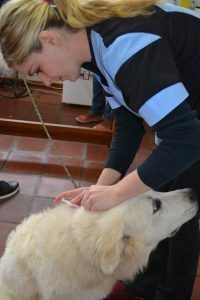 Since we know that vaccines train the immune system how to react quickly to certain diseases, we want to protect puppies from diseases we have vaccines for. If we expose our pups to vaccines, if and when their immune systems face the real disease, they can fight it more easily. Think of vaccination like a training gym where athletes prepare their bodies and minds for actual competition. 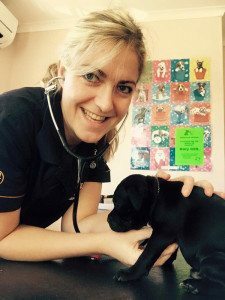 Which vaccinations does my puppy need? When a disease is widespread, dangerous—or both— researchers develop a vaccine against it. Vaccination choices are based on an individual puppy’s lifestyle and risk factors. Your veterinary team can tell you which vaccines are appropriate and how they can be given. Why does my puppy need to repeat vaccines (“boosters”)? We know that an immune system “remembers” diseases from vaccines, but we don’t know how long the memory is for each individual animal. Because we don’t want to gamble with protection, veterinarians and other medical professionals believe it’s far better to vaccinate too often than not enough. While puppies receive some immune protection from their mother after they’re born, that doesn’t last for a dog’s entire puppyhood. Eventually, puppies need to develop their own protection, and that’s where vaccines come in. Since maternal immunity can interfere with the effectiveness of vaccines, we repeat them to make sure they’re present when the puppy’s own immune system takes over. This timeline varies between individual dogs, so we follow guidelines to protect as many puppies as possible.